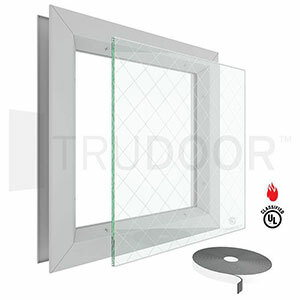 Protect3™ Safety Glass is a 1/4” thick glazing material consisting of fire-rated wire glass with a surface applied fire-rated and impact-safety rated film. Protect3™ is listed and meets all building code requirements for use in door vision lites, sidelites, transoms and borrowed lites. It’s an attractive and economical glazing solution for high traffic areas requiring fire-rated glazing – perfect for schools, hospitals, institutions and commercial projects. Labeling: After cutting, each lite of Protect 3™ Safety Glass fire-protective glass shall be permanently labeled according to local building code requirements with product and manufacturer’s name, UL certification mark, fire rating, etc. 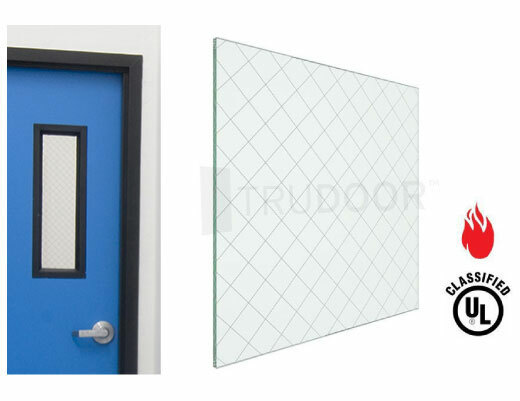 Protect3™ is a trademark of Glassopolis Inc.
Protect3™ Safety Glass is available in a complete vision lite kit (Frame, Glass & Glazing Tape). Common Sizes with a 90 Minute Fire-Rating include: 12″ x 12″, 5″ x 35″, 6″ x 27″, 7″ x 22″ and 8″ x 18″ (all 100 square inches or under of visible glass) – other common 20 to 60 Minute Rated sizes include: 8″ x 32″, 24″ x 30″ and 24″ x 56″. Custom sizes available.